What does the Alpha Hydrox Intensive Serum do? The Alpha Hydrox Intensive Serum exfoliates your skin, removing dead skin cells and refreshing tired, dull looking skin. Along with the antioxidants and hyaluronic acid in this serum, the Alpha Hydrox serum also reduces the appearance of fine lines and wrinkles, as well as age spots. At over 10% glycolic acid, the FDA considers this to be a professional grade alpha hydroxyl acid (AHA) and so care must be taken when using this at home. AHAs below 10% have light weight exfoliant properties with the results not lasting very long without repetitive usage. Above 10% and below 50% these AHA Alpha Hydroxy acid serums have varying degrees of microdermabrasion properties, so much more care must be taken using these serums at home. Make sure to always wear a sunscreen, because these alpha hydroxyl serums can make your skin very sensitive to the sun and always read and follow the instructions that come with the serum. If you are at all concerned, check with your physician before using any AHAs. Used correctly, this Alpha Hydroxy Acid Serum is said to show results almost instantly and leaves your skin softer, smoother and with a more even skin tone. After using this serum, your complexion simply glows, looking more radiant, healthier and younger. Who should use the Alpha Hydrox Intensive Serum? Anyone who needs to exfoliate their tired and dull looking skin and wants to reduce those annoying fine lines and wrinkles as well. If you don’t need the exfoliation properties of glycolic acid, but you just want to minimize fine lines and wrinkles or rehydrate your skin, then a hyaluronic acid serum may be best for you. If you want a serum to reverse the signs of environmental pollution, sun spots and age spots, then check out my vitamin C serum reviews. If you have sensitive skin, then this serum is not recommended for your skin type. How do you use the Alpha Hydrox Intensive Serum? If you have not used this glycolic acid serum before, it is suggested that you perform a patch test on your skin below the ear for 2-4 days. First time users of alpha hydroxyl acid products may notice a stinging or tingling sensation or even a redness to their skin. However, if this feels excessive to you, be sure to wash the serum off your skin with cool water and don’t use AHAs on your skin again. Also, if you have sensitive skin you can wash the alpha hydroxy acid serum off your skin after 5 to 15 minutes, however if you do have sensitive skin it might be better to have a talk with your physician before you use any AHAs on your skin – just in case. After cleansing your skin, apply the serum to your face and neck areas with a cotton ball or your fingertips and leave to absorb into your skin. You can use this serum once or twice a day, depending on your needs. The key ingredients in the Alpha Hydrox Intensive Serum are14% Glycolic Acid, Sodium Hyaluronate (Hyaluronic Acid) and Green Tea. This serum does not contain oils, fragrances or parabens and is not tested on animals. Glycolic acid is an alpha hydroxy acid that exfoliates your skin, removing dead skin cells and unblocking pores. Your skin looks fresher and healthier, with a more even skin tone and a softer and smoother feel and appearance. Depending on the percentage of alpha hydroxy acid in the serum, the effects can range from mild exfoliation, to light microdermabrasion and on to skin resurfacing chemical peels at high concentrations. Green tea is a strong antioxidant, even stronger in fact than vitamin C. With this ingredient in your serum the damaging effects of free radicals from the sun and environmental pollutants is reversed and your skin looks healthier and fresher. Sun spots and age spots are also reduced and your skin tone is more even. It is also said to help rejuvenate your skin by encouraging dead skin cells to be replaced by new, fresh cells, giving your complexion a more youthful glow. This is actually a salt of hyaluronic acid, which has super hydration properties giving your skin a deep pulse of hydration deep in your skin. With the ability to absorb more than 1000 times its own weight in water, hyaluronic acid is a fabulous ingredient to include in your serums – especially for people with dry or flaky skin or fine lines and wrinkles. This is because the additional moisture which your skin craves is now being replaced and your skin looks fresher and more plumped-up. 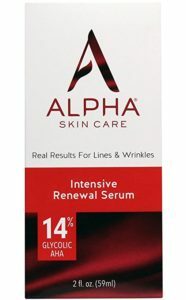 Around 80% of customer reviews gave the Alpha Hydrox Intensive Serum a 4 or 5 star rating. Even though this serum is a 14% concentrate of glycolic acid, customers stated that they either did feel some tingling or a slight burning sensation when they used it, but the results were worth it. Their skin looked brighter, more glowing, lightened sun spots and their skin is softer and smoother. I LOVE this serum. It works well with my other products and maintains my skin as well as prevents further breakouts from happening. I 100% recommend this line of skincare and serum. I saw changes to my skin in only 1 week! Wonderful! Alpha Hydrox has done it again! I have used their products since high school. Very nice product. I love it! My neck looks 10 years younger!! I have been using this for years. It really works for fine lines and to keep the skin clear. 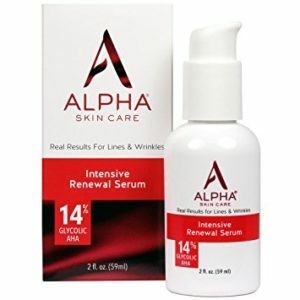 Does the Alpha Hydrox Intensive Serum really work? The vast majority of customers really like this serum and are very happy with the results. In fact, it is selling very well at the moment. It also contains hyaluronic acid as well, and is not tested on animals and doesn’t contain parabens – all good points. This is a very affordable glycolic acid serum that works well.